MVP vs MDP - about your customers or for them? JAM is coming to Red Badger for the evening and our Product Designer Clementine Brown will be your host for the evening! The idea of promoting a Minimum Desirable Product (MDP) over Minimum Viable Product (MVP) isn’t new, and yes, lots of people are talking about it. But the difference between Desirable and Viable is a subtle one, but with big implications. 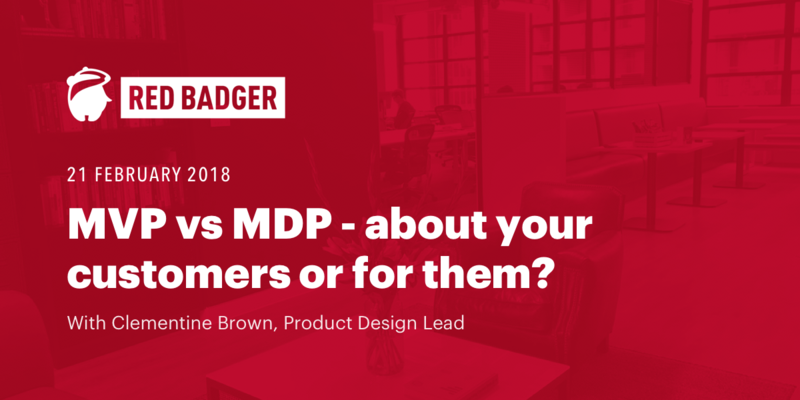 During this talk Clementine will take a look at the presence of your customers, and explore how heading for an MDP can help keep you from data paralysis, and reposition the humans at the centre of your product universe.